This week I’ve been taking the time to visit some wonderful feathered friends that aren’t usually around. It’s very easy for us to take things for granted in our lives and to not appreciate them to the fullest. The past few years I’ve had a unique opportunity and access to a beautiful flock of Tundra Swans at a friend’s house on the river but this winter he has stopped caring for them due to waterfront reconstruction. Now I lament that I didn’t take more time with the flock when I had the chance. I would go just a few times when I really could have gone as much as I pleased. And so I vowed that I need to make the effort to spend time with a few bird species that are not often seen, let along very cooperative as subjects. 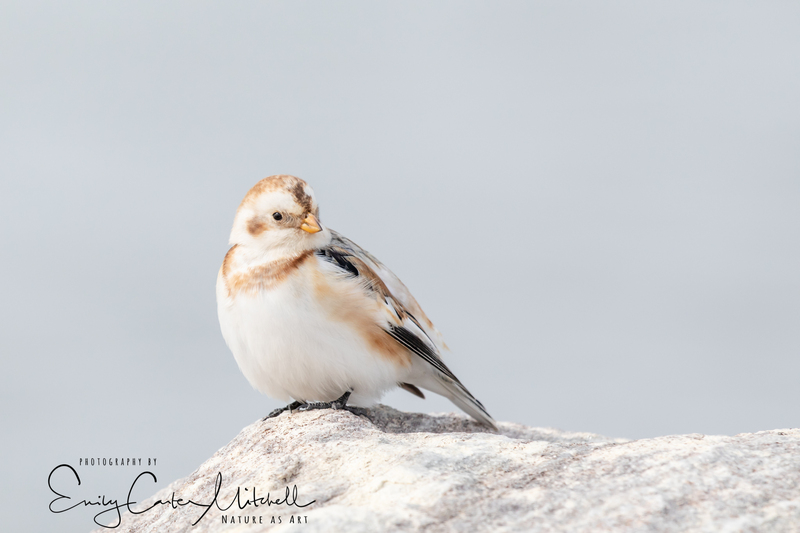 One of my visits was to North Point State Park to photograph the Snow Buntings that have been reported there the past couple months. Usually there is just a pair and they stay around only for a couple of weeks. This time there are at least ten of them hanging around and they are as charming as can be. It’s usually bitter as can be out on the fishing pier but the day was a balmy and sunny day and an unexpected friend arrived and I was able to catch up with him during a leisure visit while we sat and watched the Snow Buntings forage in the grass. As we had seen them before we knew we wanted them on the rocks as their beauty really shines. I learned from my friend that the gulls find clams and fly high over the paved fishing pier and drop the clams onto the pavement to crack them open. 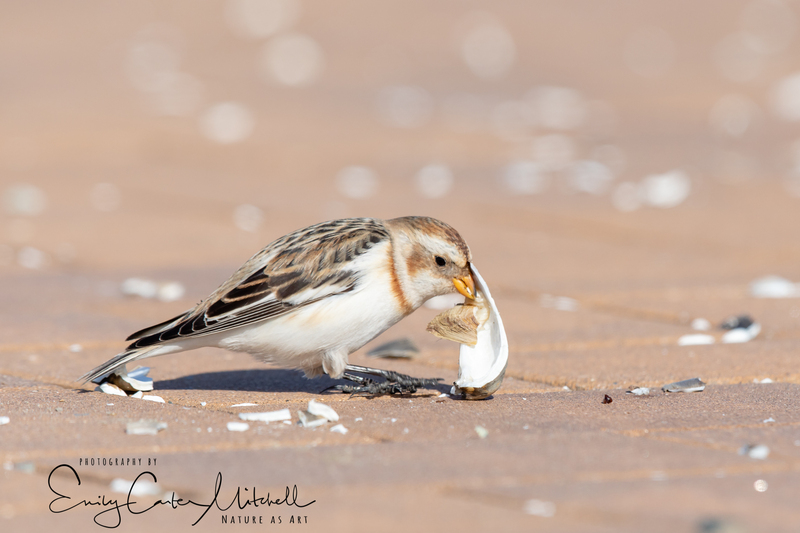 The remnants of the opened shells were strewn about and the Snow buntings would stop at each one picking at what remained. It’s been a good life lesson this week that when something beautiful comes your way, slow down, take your time and really appreciate it as much as you can. You never know when it may ever happen again. Wow, what wonderful pictures -I love them! Thank you so much Ganz. They are the sweetest birds I’ve ever met. Great to see your work again Emily. These shots are exquisite. You are so kind and it’s wonderful to hear from you Mary. I hope your painting endeavors have taken you on a beautiful journey. Thank you so very much my dear friend. Birds are great for reminding us to slow down and pay attention, I agree. 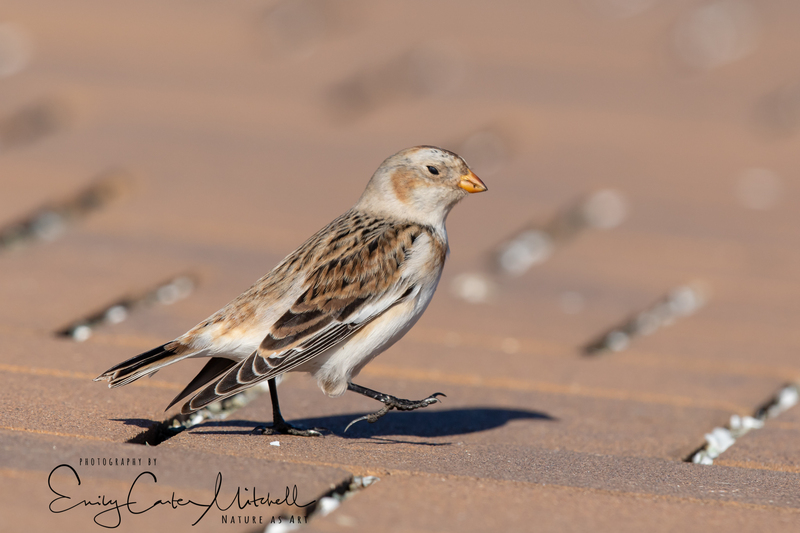 And these snow buntings are exquisite. 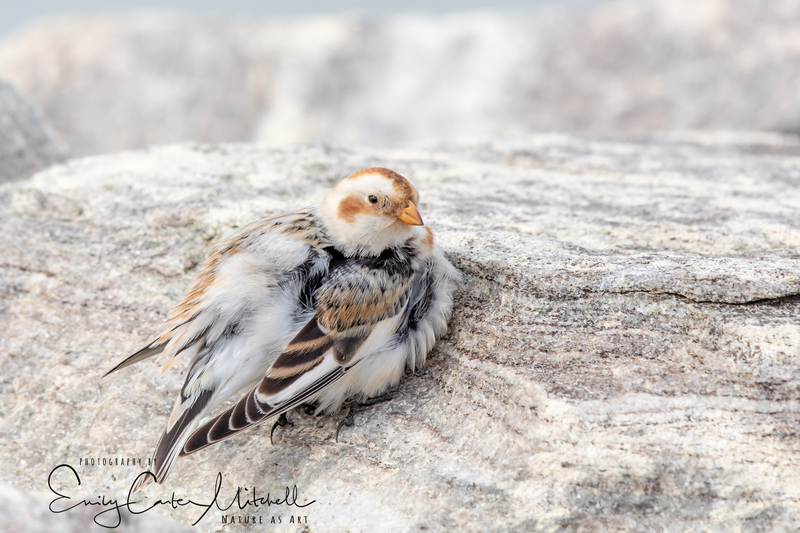 Seeing snow buntings requires braving the cold, so this is a bird I have not seen in the wild — really great to see it here, Emily. It is true, to enjoy these birds one generally has to freeze practically to death. Luckily this was actually quite a warm day all things considered. I’ve learned that to really enjoy the birds and watch them going about their lives needs one to take the time to appreciate them. Truly my pleasure to share Jet and hope all is well with you. 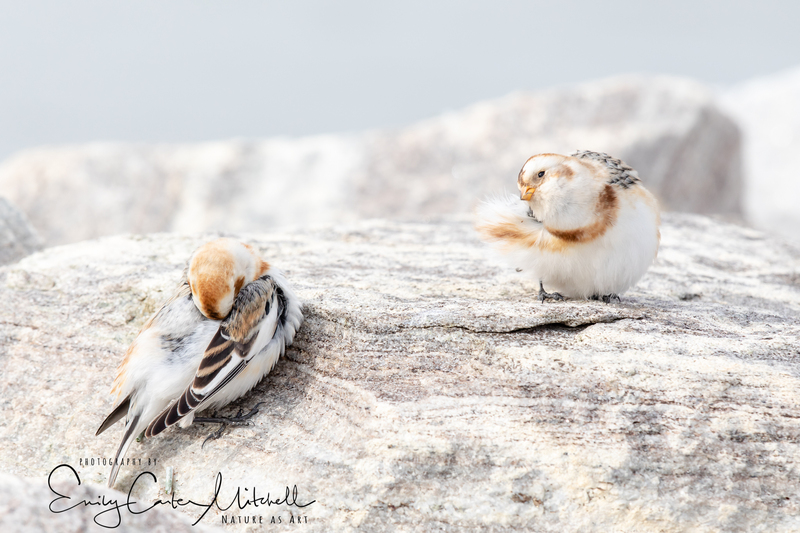 I love your snow buntings. Thank you very much Sherry. Nice shots of some pretty birds with a great story to accompany them. It is truly my pleasure to share these with you Richard, and thank you for appreciating them. I am grateful for your very kind and generous comment. Thank you so much and may all be well with you. Such pretty birds – your captures show off their many charms! I wish I could have spent all day with them Eliza. Sweetest birds ever. Thank you! So wonderful to hear your experience Samuel. You too know how darling they can be. Thank you. Your images are stunning – a balm to the senses and soul! You are so kind. Thank you for your generous compliment.